Food for me is very evocative. It links me to a heritage and generational traditions that can be found again at the tip of a fork. Ingredients and recipes connect us to the rich cultural traditions of our families and friends and in my case one of the first memories of learning to cook like an Italian. For me that would be learning to cook our Nonna’s Bolognese ragu. It is one of many dishes that define the food culture of Italy in a unique way and the legendary traditions of cooking in Bologna. It begins with the pot. You must use a stout sided pot that is capable of cooking the ragu (meat sauce) low and slow for a minimum of 2 1/2 to 4 hours. Bubbling like a cauldron, low heat and slow cooking is the secret to an authentic Bolognese so that the rich flavors have a chance to develop. Next is the sauté of the soffritto. Again a slow sweat of finely diced (battuto) onion, carrots and celery in olive oil and butter. 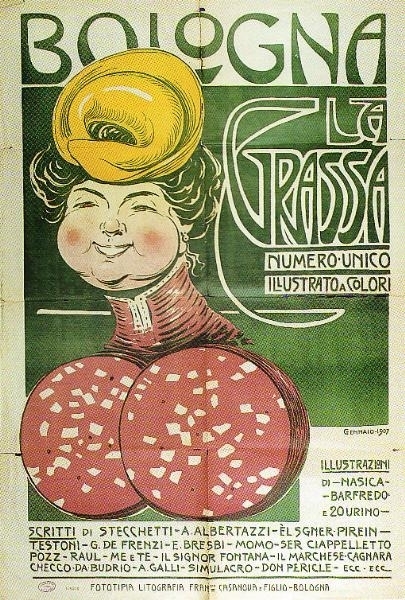 After all we are talking about Bologna La Grassa “the fat”, the rich, abundant food culture of Emilia Romagna. This region of Italy is known as the Bread Basket of Italy and the city of Bologna is especially blessed with cooks whose resumes date back to the Middle Ages when students from all parts of Europe came to study at the renowned University. Students had servants and servants were cooks and as a result Bologna developed a culture of sophisticated foodies. As to seasoning. This is not a spaghetti, marinara or meatball sauce. No basil, no garlic. no oregano. Just salt and pepper. This is a sauce for a purist. A sauce for one who appreciates meat (beef, pork, veal). The tomato is a supporting player and should be used judiciously. Finally the pasta. Never, ever is an authentic Bolognese Ragu paired with spaghetti. Tagliatelle, freshly homemade, is the only recognized pasta to be served with this hardy, full-bodied sauce topped with a sprinkling of fresh grated authentic Parmigiano-Reggiano cheese. 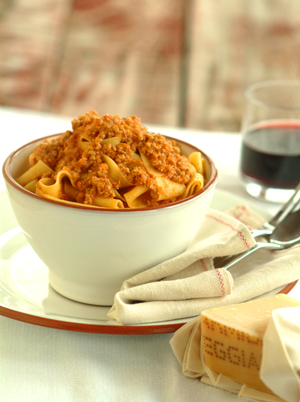 There are as many variations of Bolognese sauce as there are Italian cooks. Some include a touch of milk (never cream) to mellow the flavor and soften the texture of what were once gamy meats. Some use a sprinkling of nutmeg but these additions vary among different families and recipes. In 1982, the Academia Italiana della Cucina officially registered the recipe with the Bologna Chamber of Commerce. According to the academy a classic Bolognese Ragu must include onions, celery, carrots, pancetta, ground beef, tomatoes, milk and white wine. Look beyond the fork and you will find a fascinating gastro-history of a classic Italian dish that every time I make it brings Italy home.